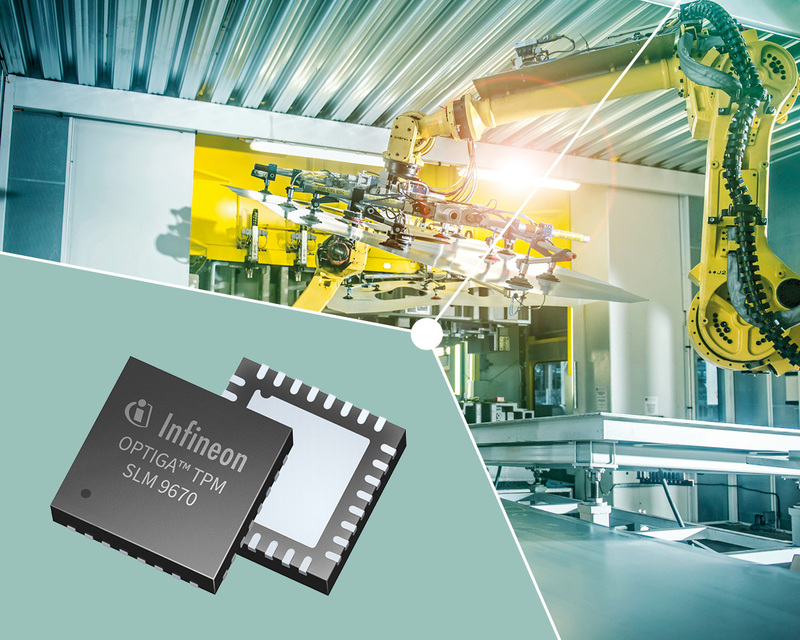 Munich, Germany – 27 March 2019 – Infineon Technologies AG (FSE: IFX / OTCQX: IFNNY) presents the world’s first Trusted Platform Module (TPM) specifically for industrial applications at this year’s Hannover Messe (Hannover, Germany, 1-5 April 2019). The OPTIGA™ TPM SLM 9670 protects the integrity and identity of industrial PCs, servers, industrial controllers or edge gateways. It controls access to sensitive data in key positions in a connected, automated factory as well as at the interface to the cloud. The TPM acts as a vault for sensitive data in connected devices and lowers the risk of data and production losses due to cyber attacks. Users’ benefit is not limited to security only as TPMs also help to shorten time to market and reduce costs for industrial applications. Through the use of Infineon’s audited and certified TPMs, manufacturers of industrial devices can achieve higher security levels of the IEC 62443* standard and accelerate their certification processes. Furthermore, they can cut costs for maintenance of the devices through secured remote software updates. The OPTIGA TPM SLM 9670 fully meets the TPM 2.0 standard of the Trusted Computing Group and is certified by an independent test lab in accordance with Common Criteria**. With a service life of 20 years and the ability to update the firmware on the chip, the TPM is able to cope with long-term security risks that may be encountered in an industrial environment. The chip boasts an extended temperature range of -40° to 105° Celsius and meets the stringent requirements of industry in terms of robustness and quality as it is qualified according to the industrial JEDEC JESD47 standard. The Internet of Things is increasing the fields of application for the TPM. With its extensive OPTIGA TPM product family, Infineon offers application-specific solutions for business PCs and routers, connected vehicles, or cloud applications. The OPTIGA TPM SLM 9670 will be presented for the first time at this year’s Hannover Messe, the world’s leading industrial show. Infineon will show various products and a demonstrator for energy-efficient and secured smart factories at the stand of Amazon Web Services (Hall 6, Stand F46). This demo includes also an edge gateway which is a perfect place for the strong security of the OPTIGA TPM SLM 9670 because of the gateway’s central and security-critical function in industrial networks. *IEC 62443 is an international series of standards that defines the IT security requirements for industrial communication networks. **Common Criteria is an international standard for computer security certification. The OPTIGA™ TPM SLM 9670 protects the integrity and identity of industrial PCs, servers, industrial controllers or edge gateways.